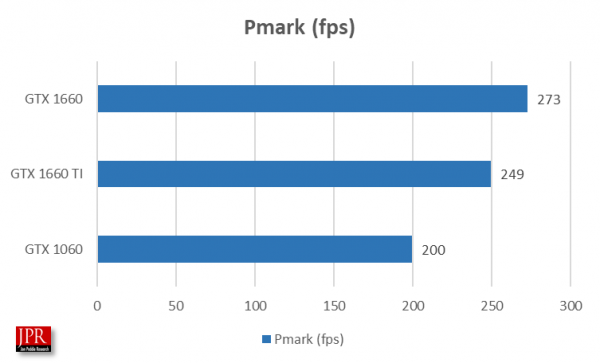 As Nvidia drives down the Turing GPU design into more affordable segments, it brings plenty of performance and advanced features with it, albeit ray tracing acceleration isn’t one of them. 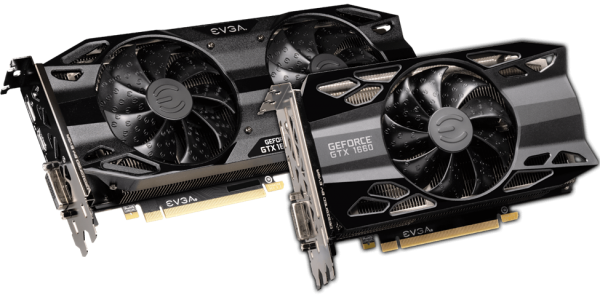 EVGA GeForce GTX 1660 Ti & GTX 1660 2 Slot Cards are longer but allow for more airflow at slower speeds with two fans. Utilizing a smaller fan hub, these fans feature a longer blade to increase airflow while remaining quiet. We were impressed with the GTX 1660 Ti when we tested it (see: https://www.jonpeddie.com/reviews/nvidia-has-a-new-winner-gtx-1660-ti), and we like the GTX1660 even more. It doesn’t get as high as scores as the Ti version, but it costs less and uses the same power so its Pmarks in fps and scores is higher. 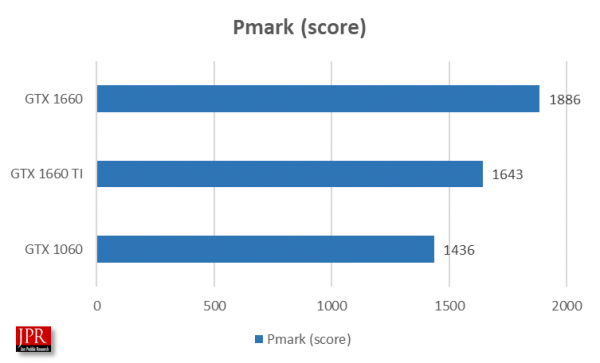 We also calculated the Pmark using benchmark and game scores, and again the GTX 1660 was the winner. We put the three AIBs through a series of games and synthetic benchmarks and then averaged the results from all of them to arrive at the performance parameter for calculating the Pmark. The GTX 1660 uses TU116 Turing GPU the same as the 1660 Ti but has 6GB of DDR5, rather than DDR6 memory. Therefore, its memory clock (8 GHz rather than 12 GHz) is lower, and 192.1 GB/s memory bandwidth, compared to 288.1 GB/s on the Ti version. The GTX 1660 runs a slightly faster clock and boosts clock speed, however, at 1530 MHz and 1785 MHz, compared to 1500 and 1770 MHz on the GTX 1660 Ti. Nvidia’s AIB partners now have an AIB at all price and performance ranges, and more are coming. The Final Fantasy benchmark page shows a GTX 1650, so one must be coming. The Turing architecture has proven itself to be very scalable. Combined with binning, Nvidia is able to offer its AIB partners and OEMs an AIB for any price–performance point. That is going to put severe pressure on AMD to match the spread of products.